In the post-War years, the public tired of superheroes and publishers searched for new subject matter. 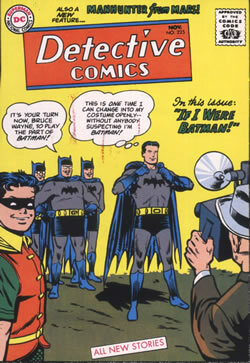 Western, Crime and humour comics racked up sales while the caped crimefighters quietly went into retirement. EC Comics made a killing (almost literally) with their range of horror comics and their success led directly to the censorship movement that resulted in the Comics Code Authority. 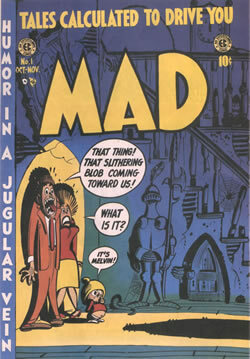 The only EC Comic to survive was the humor title Mad. DC's superheroes somehow managed to hang on and the firm even began creating new superheroes during the 1950s, like Detective Comics' Martian Manhunter and the hugely influential revival of The Flash in Showcase. The main DC characters Superman, Batman and Wonder Woman survived the downturn in superhero comics during the 1950s This issue of Detective Comics marked the debut of a new science fiction superhero, Manhunter from Mars. 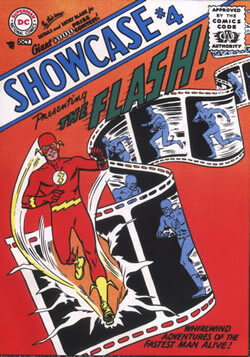 The Silver Age really began with the introduction in 1956 of another science fiction based superhero, The Flash, a remodelling of the classic 1940s character from the same company.